Few destinations evoke visions of paradise like Bali. With its stepped terraces of rice, dramatic highland gorges, beaches of volcanic sand and omni-present Balinese dance-drama, the name of the place is a panacea. There’s one corner of Bali that remains largely untouched and truly delivers on these visions of paradise. Still a pristine, culturally vibrant and spiritually charged local preserve that slips under the majority travellers’ radars. Welcome to the fertile Tabanan Regency. A vast patchwork of blazing green and gold rice fields blankets the area’s 839 square kilometres, nurtured by an irrigation system, known as the Subak, that was developed in the 9th century and is now recognised by UNESCO as a cultural asset. 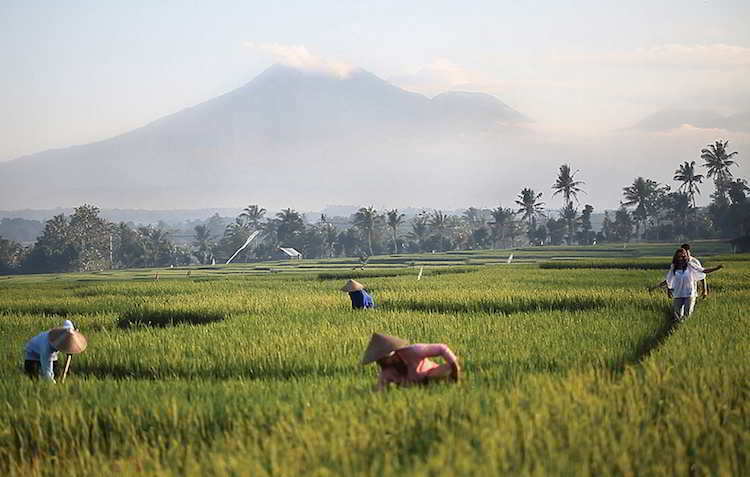 The most scintillating jewels in the Subak crown are the beautiful Jatiluwih rice fields. The UNESCO protected rice fields step down from volcanic Mount Batukaru in a series of iconic terraces. Reaching 2,275 metres above sea level, its top often obscured by cloud, Batukaru dominates the Tabanan. Unlike other mountains in Bali, it is rare to encounter other trekkers on a nine-hour ascent of the island’s second highest volcano. You’re much more likely to encounter Kijang (small deer), Pangolin (ant eater), and Macaque (monkeys). Its summit is worth the challenging hike, offering a sweeping vista of Mount Agung, Bali’s tallest mountain, Lombok Island and Java Island. Authentic, quaint villages, where the warm, industrious Balinese people’s centuries-old way of life remains intact, are scattered throughout the picturesque countryside. Smiling women and men stroll along narrow streets lined with frangipani, bougainvillea and coconut trees, balancing offerings of fresh fruit on their heads and shoulders respectively. The regency’s secluded south-west is bordered by black diamond sands punctuated by volcanic rock cliffs jutting out into the Indian Ocean. The Tabanan is home to one of Bali’s most sacred sites, Tanah Lot Temple, a 16th-century Hindu sanctuary perched on a offshore rock cradled by craggy cliffs. This is Bali, as it should be. The rice bowl of Indonesia. On the edge of a black diamond sand beach surrounded by rice fields, the independently owned and operated Soori Bali was conceived as a private vacation home for the family of the renowned architect, Soo K. Chan. Yet the setting was so breathtakingly beautiful, and its feng shui so compelling Soo expanded his original vision from a private retreat to a more public experience. All of Soori Bali’s 48 villas feature private pools with sweeping vistas of the ocean or rice fields under the gaze of Mount Batukaru. The EarthCheck Gold-certified resort’s expansive facilities include an infinity pool, gymnasium, library, spa, helipad, two gourmet restaurants serving Indonesian and European cuisine, leisure concierge and butler service, and round-the-clock room service. The recently relaunched resort boasts a genuine connection to its local community and environment. Its holistic design respects the integrity of Subak, with villas located around irrigation channels and village processional routes. A total of 10 temples are situated on site in accordance with a design developed by a local religious leader. Beach parades, onsite prayers and blessings and the artistry of visiting local musicians and dancers also open windows to Balinese culture. Guests are regularly treated to lively, colorful dance rehearsals and performances in the late afternoon and evening, by a local traditional dancing school for the Kelating village girls supported by Soori Bali. The resort’s special new menu features farmyard chicken, Muscovy duck, quail, freshly caught fish and organic vegetables. It’s slow cooked with authentic Balinese spices on a traditional pit using black volcanic sand from Soori Bali’s beach and served as a complement to a performance of Balinese dancers moving to the strains of live gamelan players. One of the most iconic gamelan instruments is the rindik, a bamboo version of a xylophone. The soft, subtle notes - sounded as the traditional instrument’s bamboo tubes of varying widths and lengths are struck with mallets in both hands - are ubiquitous across Bali. It may look effortless to play yet mastering the rindik takes years of practice. The traditional Kecak dance, a dramatization of the epic story of King Rama rescuing his wife Sinta with the help of an army of monkeys led by Hanuman, is a welcome assault on the senses. Typically about 100 men sit in concentric circles around an oil lamp, chanting and chatting until they fall into a trance. As Soori Bali started out as a private family vacation home, the resort’s innovative “journeys” program is built around authentically-enriching experiences including visits to the onsite bat cave, kite-making, cooking classes with the chef, horseback riding on the beach, and indigenous fishing. You can even try your hand at learning to play the rindik. A team of onsite practitioners and visiting wellness experts offer physical alignment and massage therapies, acupuncture, meditation, neurotherapy, and longevity procedures among many bespoke techniques. 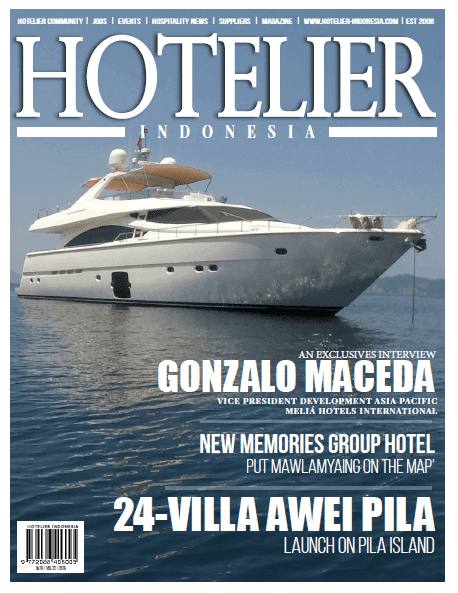 Soori Bali, the newest member of Leading Hotels of the World, is remote yet accessible. Just over an hour's drive from Denpasar, and 20 minutes from Tanah Lot, Soori Bali’s location allows travellers to discover the Tabanan, Bali’s last wild frontier. The ‘Bali of old’ remains intact. You just need to know where to look. 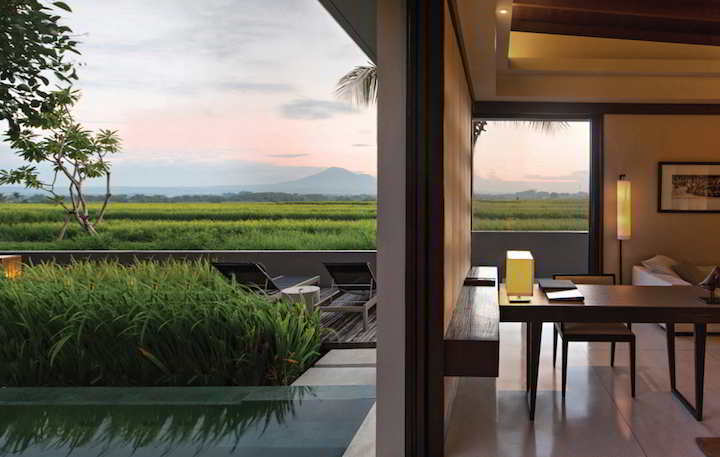 Soori Bali is surrounded by rice fields under the gaze of Bali’s second highest mountain, Mount Batukaru. Bali’s naming system: The Balinese name their children based on the order they are born, with the same names for both males and females. The firstborn child is named Wayan, Putu or Gede, the second is named Made or Kadek, the third child goes by Nyoman or Komang, and the fourth is named Ketut. Day of silence: On New Year’s Day, known as Nyepi, the Island of the Gods completely shuts down for 24 hours. No one leaves their home on this day of contemplation, meditation, fasting and reflecting on the past year. Shops, restaurants and beaches are closed, electricity use is kept to a minimum and even the airport closes. In a trance: A form of Balinese dance and music drama, Kecak is performed by more than 100 men sitting in concentric circles and percussively chanting “cak” as they move their arms about. Also known as Ramayana Monkey Chant, this piece draws inspiration from Sanghyang, a trance-inducing exorcism dance. Touching Earth: For the first three months of their lives, babies are carried everywhere. Why? They are not ready to touch the ground to keep their connection to spirit intact. Once babies are three months old, they are blessed at a ceremony and their feet touch the ground for the first time. Reaching adulthood: The Balinese mark the transition from child to adult with a ceremony that includes filing of the filing of the incisor teeth, which are deemed uncouth and need to be filed down. In addition to helping one become stronger, it is also believed the ceremony helps mitigate evils such as greed and jealousy. Check out our videos of life at Soori Bali on Instagram here. 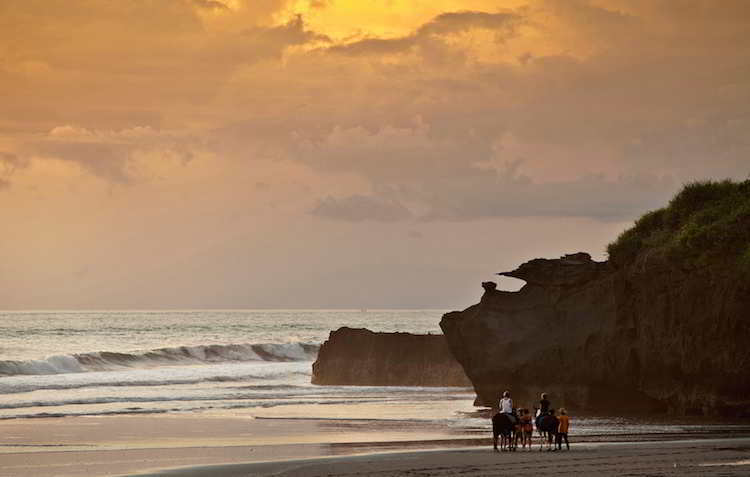 Soori Bali overlooks a stunning stretch of black diamond sand volcanic beach. How much? Aji kuda niki? What time is it? Jam kuda niki? How are you? Punapi gatra? Where have you been? Dija mara? Where are you going? Kal kija?